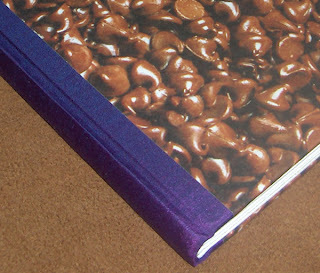 This yummy chocolate book was submitted to the book swap by Kiley, KupoKiley. 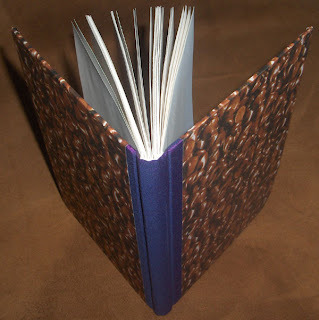 This was the first case-bound book that Kiley ever made on her own after taking a bookbinding class and the first book she ever listed on Etsy. 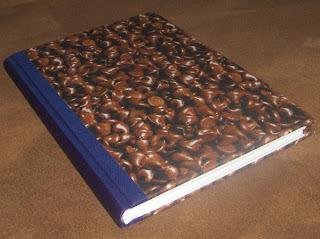 Kiley says, "I loved the purple/pinky book cloth and the chocolate paper was just too whimsy for me not to use with it. I originally bought the paper to make a gift for my sister-in-law but didn't get the book finished in time. So it became the first book I listed on Etsy. When the Etsy listing expired, it had over 2000 views and hundreds of hearts. I decided not to renew it and enter it into the book swap hoping that its crazy book cloth and paper would put a smile on someone's face." Visit Kiley's shop to see her other work: KupoKiley.Etsy.com.